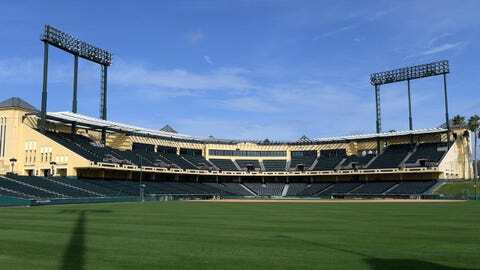 This spring training marks the Braves' last Disney before they move to their new complex in North Port, Fla.
ATLANTA — FOX Sports South and FOX Sports Southeast will televise six Atlanta Braves spring training games for the 2019 season, starting on Tuesday, March 5, at 1:00 p.m. ET against the New York Yankees on FOX Sports Southeast. The networks’ First Look at Braves baseball will also include one exhibition game against the New York Mets, two against the Detroit Tigers, and two at SunTrust Park against the Cincinnati Reds. Additionally, the networks will debut a preview show highlighting the defending NL East champions. Atlanta Braves Spring Training: All-Access presented by YellaWood will include interviews with players, manager Brian Snitker, and general manager Alex Anthopoulos, along with special features from FOX Sports reporter Paul Byrd. The show will premiere Monday, March 11 at 7:00 p.m. ET on FOX Sports Southeast with an encore airing at 11:00 p.m. ET. Atlanta Braves programming televised on FOX Sports South and FOX Sports Southeast will be available on the FOX Sports digital platforms.Available to iOS and Android devices, the platforms provide live streaming video of FOX Sports content along with highlights and instant alerts for scores and key plays. FOX Sports South and FOX Sports Southeast is the exclusive regional home of the Atlanta Braves. The networks are scheduled to televise 154 games this season, including extended programming for Opening Day on Thursday, March 28. A complete television schedule will be announced at a later date. Extensive Braves coverage from FOX Sports South is also available on Facebook, Instagram and Twitter, featuring news, analysis and insight. The popular Chopcast podcast can be found on iTunes, SoundCloud, Spotify and Stitcher Radio, and the interactive show Chopcast LIVE will air weekly on Facebook Live. The FOX Sports regional networks serving the Southeast – FOX Sports South and FOX Sports Southeast – collectively reach nearly 11 million households across seven states. They are the television home of the Atlanta Braves, Atlanta Dream, Atlanta Hawks, Atlanta United, Carolina Hurricanes, Charlotte Hornets, Memphis Grizzlies, Nashville Predators, Cincinnati Reds, Indiana Pacers, New Orleans Pelicans, St. Louis Cardinals, Bundesliga, Atlantic Coast Conference, Big 12 Conference and Big East Conference. Combined, the networks televise nearly 3000 live events and studio shows annually.